WARNING: Do not listen to this program in your car, your car might go to sleep as well. 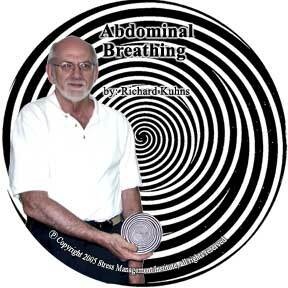 Abdominal Breathing Program . This is an active form of relaxation for deep breathing. It is the same training that I used in Biofeedback sessions with my clients for nearly 20 years to promote muscle awareness. With Track 2 you develop abdominal breathing as a new habit. Track 3 has you tense and relaxing various muscle groups for profound muscular relaxation. Track 4 focuses on differential relaxation. For instance, if you're about to putt a golf ball, there's no need for muscular tension in your face, or if you're driving a car, there's no need for muscle tension in your jaw or your arms unless you're using those muscles to perform a task. This excessive unneeded muscle tension in other muscles contributes to poor performance in sports, an overall feeling of anxiousness, and sometimes muscle pain. By mastering this exercise in differential relaxation where you learn to tense selected muscles and keep other specific muscles relaxed, you'll more often become aware of the excess tension during the day and release it. Track 5 incorporates all of the above skills to bring you the value of centering. Yes, with a single thought you can let go of all tension in your body. You can center yourself while at the computer, talking on the phone, giving a speech, driving down the street, eating dinner, or... Relaxation is yours for the doing. The How To Relieve Stress That Can Be Crippling free article will provide you with overall approach to dealing with crippling muscle tension. The Total Body Relaxation Program exercises go like this. a. Slowly tense a particular group of muscles keeping the rest of your body relaxed. b. Cause it to become tense and hold that tension for a few seconds. c. Slowly let the tension go as you breathe deeply. • Lift your shoulders high to tense them leaving your arms just hanging loose. • Push you head into the back of a chair to tense the neck. • Take a Deep Breadth and hold it to tense your chest. • Tense your right and then left leg. • Tense your right and then left foot. This is a general relaxation that should take approximately twenty minutes. For specific muscle groups the muscles groups are refined to include only the affected muscles. For instance a cd is available for handling the neck and shoulder -- another for just for stuttering which focuses on muscles of the mouth and tongue. Usually a combination approach of dealing with the life crisis plus muscle relaxation exercises over the course of two to three months is all that's required to gain a significant foot hold on the problem. And this is pretty good considering these problems often exits for years before starting this stress management technique.